Nanopore technology is emerging as one of the leading contenders for next generation sequencing. The concept of nanopore sequencing was envisioned in the early 1990’s by David Deamer (UC Santa Cruz) and Daniel Branton (Harvard). The National Human Genome Research Institute has funded research in this area with the goal of sequencing human genomes for $1000 or less, and many investigators have contributed to developing the technology. Beginning with proof of concept studies using alpha hemolysin (see rendering this page) and nucleic acid homopolymers, we have now established methods for base identification and enzymatic control of DNA movement through the nanopore. The basic research effort spans 15 years, and came to fruition with the recent announcement by Oxford Nanopore Technologies that they will manufacture and market sequencing devices called GridIon and MinIon which are based on intellectual property developed at UCSC. Basic science of nanopores and their implementation in biotechnology. Examining the molecular mechanics of individual DNA polymerase complexes at the single molecule level, with sub-milllisecond and single nucleotide precision. Identification, cloning and expression of new DNA polymerases for nanopore sequencing applications. Evaluation of new protein nanopores used in combination with enzymatic control of DNA movement through the nanopore (Collaboration w/ Jens Gundlach, at University of Washington). Use of nanopores for detection of biosignatures in water samples. Our research is focused on the use of nanopore detectors - instruments built around a nano-scale pore in a thin membrane, for the study of biopolymers. These pores are just big enough to fit a single strand of the polymer - DNA for example. We can use these pores to understand the dynamics of DNA duplex ends, or to learn the fine-scale motions of a DNA processing enzyme like DNA polymerase. 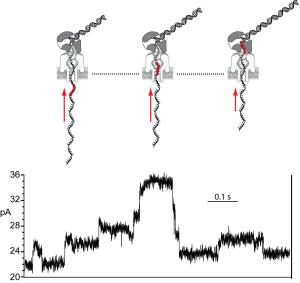 The rate of movement of a DNA strand through the nanopore can be contolled by the use an enzyme such as a DNA polymerase (shown in dark grey, upper panel). The DNA polymerase molecule acts as a motor to draw a DNA template strand through the pore in single nucleotide (5 Angstrom) increments as it catalyzes DNA replication (red arrows indicate the direction of movement of the DNA substrate). Current traces (lower panel) show the resulting changes in ionic current amplitude as nucleotides move through the pore.